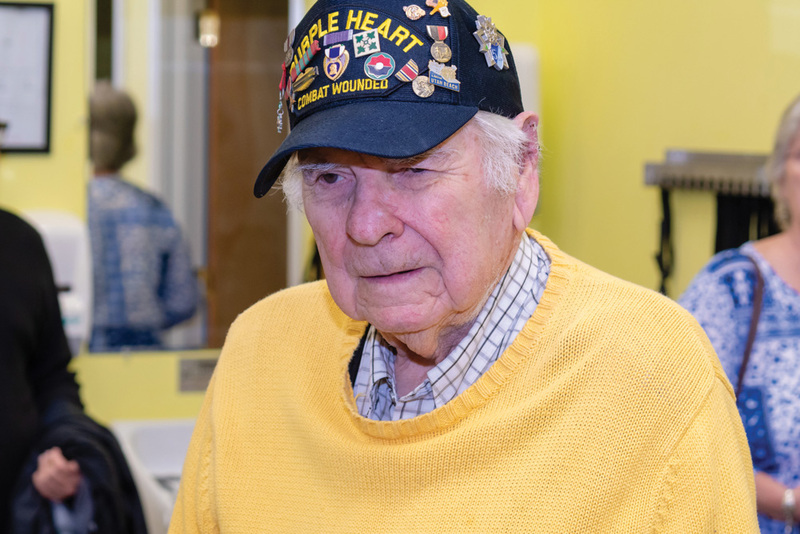 A Quilt of Valor was presented to John Roman at Aquacare Physical Therapy on Monday, Oct. 15. Pictured are: (back row) Bob Clemens, Pat Clemens, Diane Cowell, Barbara Voit, Dan Cowell, Janet Thomas, Ellen Neumann, Eric Neumann and Pat Holleran. (Front row) Jacquie and John Romanand Lenny Truitt. Roman shows the patch sewn onto each Quilt of Valor. 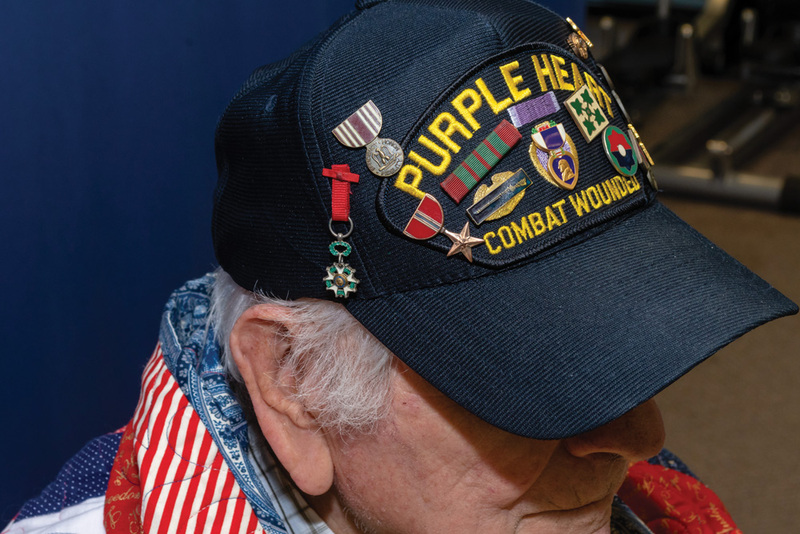 Lenny Truitt calls herself a product of the Vietnam era, and as such, she said, she has a keen awareness of the struggles faced by military service members returning from that war. 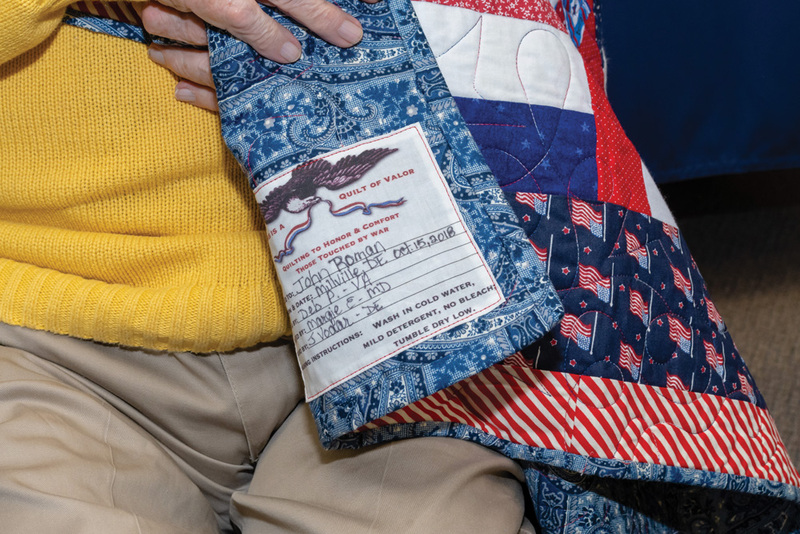 It was her sense of wanting to do something to heal that pain that led Truitt to getting involved with Quilts of Valor, which donates handmade quilts to service members. For the past nine years or so, together with co-coordinator Laurel Braunstein — and with space provided by Kathy Lewis, owner of Dagsboro’s Serendipity Quilt Shop — Truitt has been holding periodic “sew days” open to anyone who wants to lend a hand in making the quilts. 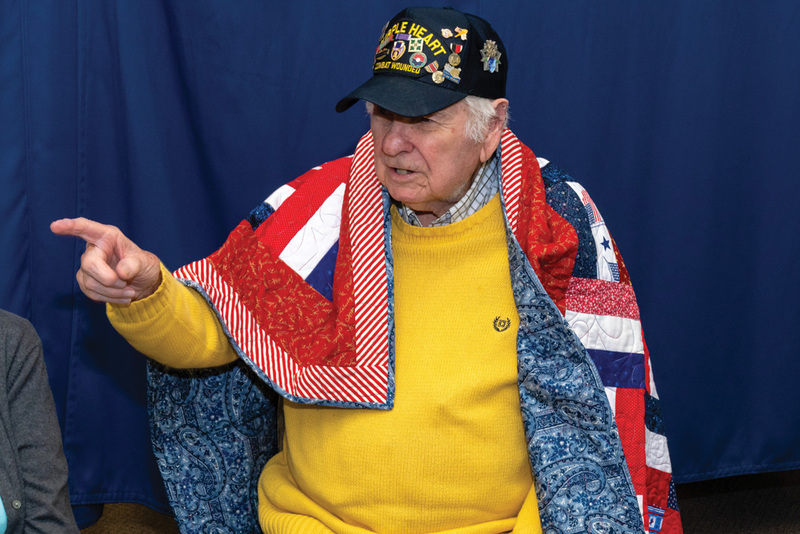 Truitt emphasized that while there are always experienced quilters on hand, no experience is necessary to help make the quilt blocks that will be sewn together and given to service members, who have either requested them for themselves or whose family members have requested them. She estimated that over the years, her Quilts of Valor group has produced between 150 and 170 quilts. “We have a dedicated group. They work very hard,” she said. In fact, Truitt said, she currently has stacks and stacks of quilt blocks that she hasn’t been able to get put together into quilts, so she has held fewer “sew days” this year. The actual quilting and binding of the quilts is often done by experienced quilters who “volunteer to do so many a year,” Truitt said. On the sew days at Serendipity, “We can have anywhere from six to 20 people,” Truitt said. Some are experienced quilters, but many are not. Sewing machines are brought to the shop for the day, and “as long as you can follow directions,” just about anyone can help, Serendipity owner Lewis said. Many of those who participate are local, but each time there is also a contingent from the Port Mortuary at Dover Air Force Base. Truitt explained that each service member who finishes a rotation at the mortuary is given a Quilt of Valor quilt. “They like to pay it forward,” she said. The Port Mortuary staff members “bring a different energy” to the sewing gatherings, Truitt said, because “most of them are young,” and they are just about evenly divided as far as gender. She said the mortuary staff members often leave with a new appreciation for the quilts they will receive, as well as enjoying the camaraderie of the day. 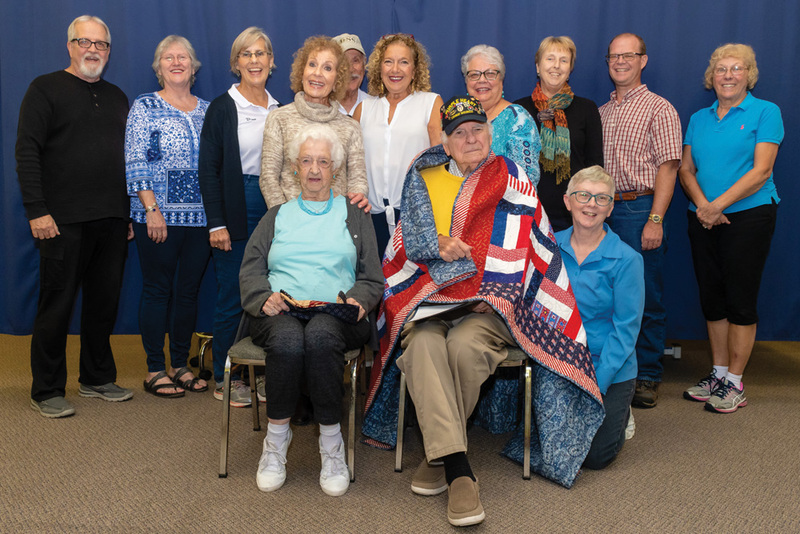 While any quilt design can be made for a Quilt of Valor, Truitt said she long ago came to the conclusion that simpler is better when there are so many hands involved in each quilt. Most of the quilts are so-called “string quilts,” which tend to be more forgiving and more flexible for the varied levels of experience of the participants. “It allows us to us many patterns and many scraps of fabric, and we get a lot more use out of the fabric we have,” she said. When each quilt is completed, it is labeled permanently with the recipient’s name, as well as the names of the individuals who completed the major steps, including quilting and binding each quilt. “But that really doesn’t give you an idea of how many hands touched that quilt,” Truitt said. Over the years, Truitt said, she has participated in many Quilts of Valor presentations to service members. “Each one is different,” she said. She recalled one man, a World War II POW, who stood in front of her and “sobbed like a child” when he received his quilt. Another, a Vietnam veteran, put his quilt in his attic and didn’t take it down for several years. 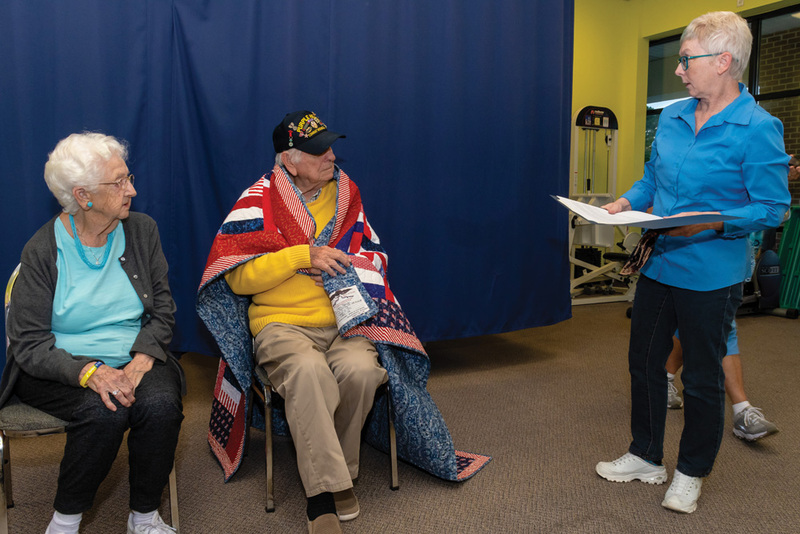 When he did, Truitt said she later learned from his wife, he was finally, for the first time, able to talk about his experience in Vietnam — always with the quilt in his lap. There will be a Quilts of Valor “sew day” on Saturday, Oct. 20, from 9 a.m. to 3 p.m. at the Serendipity Quilt Shop, 31821 Cannon Street, Dagsboro. For more information on Quilts of Valor, visit the group’s website at www.qovf.org. For more information on the event at Serendipity, call the shop at (302) 732-6304.